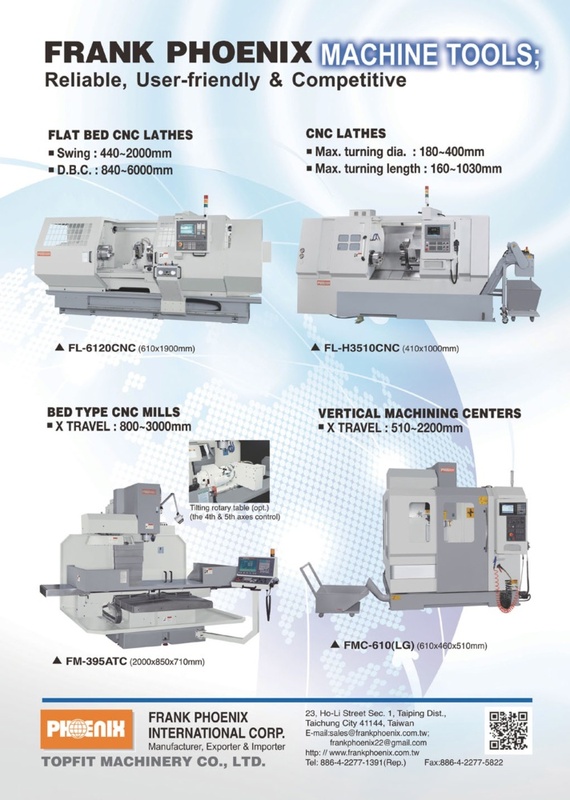 'FRANK PHOENIX INTERNATIONAL CORP.' is the leading manufacturer and exporter of machine tools and accessories in Taiwan for over 16 years . With the incessant development and promotion over the past decade, our machines and accessories have been promoted very successfully in the worldwide market due to our high quality with competitive price. -Bed Type CNC Milling Machine: X axis travel: from 800~3000mm. -CNC lathe: swing over bed x d.b.c. : 450~1200mm x 1000~6000mm. 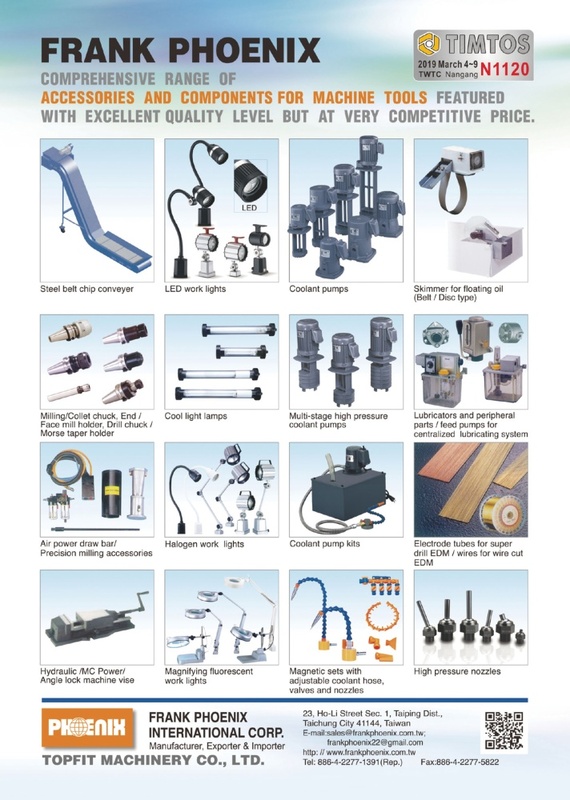 The main series of our accessories and components are 1)Adjustable coolant hoses, valves and nozzles, 2)Under water coolant pumps, self-priming coolant pumps, Vertical multi-stage high pressure coolant pumps and coolant pump kits, 3)Work lights 4)Steel belt chip conveyer , 5)Jig blocks/sub stables for machining center/CNC mill. 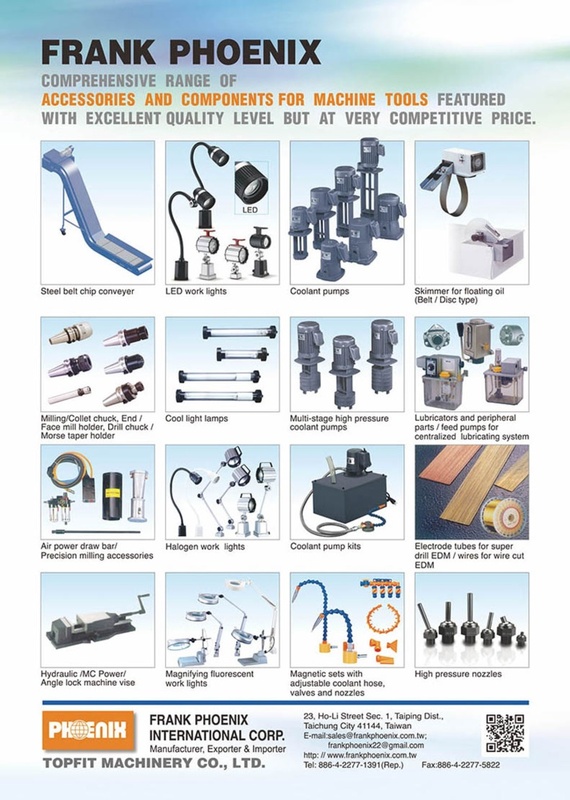 6)Skimmer for floating oil, 7)Lubricator and peripheral parts/feed pumps for centralized lubricating system, 8)Air power draw bar ,9)Electrode tubes for super drill EDM. 10)Power table feed/gear type power table feed, 11)Cartridge filters for die sinking EDM, 12)Others…etc.